On 9 February, Roundwood Primary School in Harpenden opened their doors to the Tesco Labs team. Colleagues were visiting with the aim of engaging children from years 1 and 2 in a new activity, designed to promote an understanding of technology in retail, coding and creative thinking. The brief for the session was to design and execute an event for children aged 5-6 (KS1), to last ninety minutes. The event should promote technology, and preferably work around the theme of retail. Following research which showed that children develop gender-related stereotypes around careers as young as 5 years old, the aim was to enthuse children about technology, and to dispel any preconceptions that the children may have about careers in technology being male-oriented. In order to achieve this, we chose to work with the “Cubetto”, a small robot controlled by basic coding principles. Although the children had some basic experience of Scratch, only a handful had used Cubetto before. 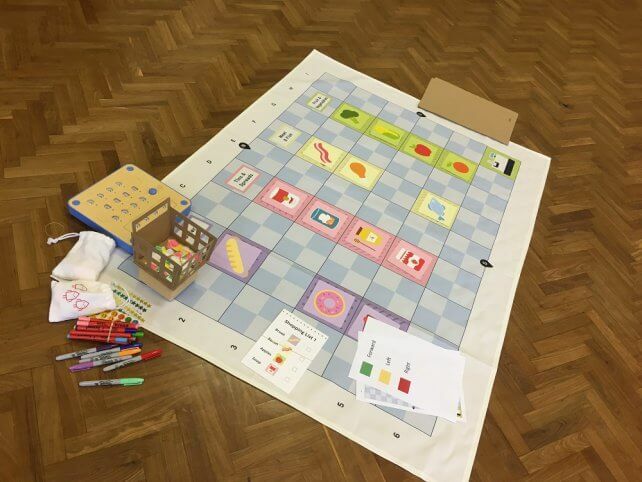 With a range of specially designed accessories, including a playmat showing the layout of a store, a range of shopping lists, and a flatpack mini-trolley (thanks to Ape Creative), the team were well equipped to bring the activities to life! Three groups of thirty children participated, with great success. Following a short introduction to Tesco’s Technology team, and technology in retail, each group was fully engaged in the challenges set, which included creating their mini-trolley, learning how to put together a string of instructions for the robot, and finally completing complex routes around the “shop” to collect pre-determined items. We were delighted with the way that the day ran, and would like to thank Laura Fricker of Roundwood Primary for inviting us, and helping to facilitate the day. With initial feedback from the children including more than one request to join the team, we’re looking forward to working more with the technology specialists of the future!